Inside the email demon video training course you are going to learn how to write money making emails and I reveal the mistakes I made so you don’t have to. 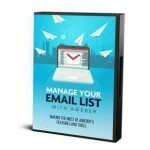 Discover The Simple Way Of Writing Emails That Makes Money Every Time! introducing… Email Demon Video Training Course! You are going to learn how to literally turn your subscribers into a rabid list of buyers who can’t wait to open your emails! Click here to purchase the Email Demon Online Video Course and start making money with niche sites now.